I saw an ad and fell for the smart pill scam called Acceleral. Unfortunately I ordered the product. With all the hype, I just fell for the ad and purchased the product.Afterwards I was having some concerns, so I searched Google for the ad and I couldn’t seem to find it. The ads for the product posted extraordinary claims for helping with memory and improving cognitive brain function. It was similar to other nootropic brain supplements I had used in the past. However, this time it was different. I had unknowingly signed up for a type of bait and switch. The ad promised a risk free trial. It turns out that this was a scam that also signs you up for an automatic monthly processing fee of $90. I want to alert everyone about this shameless deception. The Smart Pills Scam – Free Trial Offer! Customers can purchase this “trial” for a few dollars to cover shipping and handling. However, these turn out to be quite different than what you might expect. In order to get your “trial” you have to sign onto their forms to receive their free product. Read the TERMS AND CONDITIONS before you agree to your $4.95 FREE TRIAL BOTTLE , or you are agreeing to be charged a monthly fee of $90. So, your Free Trial costs you – $90 a month! This is a deceptive practice that falls under the FTC definition of a “Free” Trial Offer. But, chances are nobody will ever see those Terms and Conditions! Why? They are deliberately placed out of sight on the page! The terms and conditions are listed completely at the bottom of the page. Nobody will ever find them in that spot! The facts of the subscription should be clearly posted as a condition of purchase.They require you to agree to enroll in a monthly subscription as soon as you order the product. But, you don’t know that! The free trial costs $90 a month! If these conditions were known, people would not touch THE FREE TRIAL of the product. Because it is no Free Trial , just a deception! Unknown to you, you will be charged for your free trial. They led you to believe it was only going to cost $4.95 to try the product! Your credit card is automatically charged $90 monthly. And to cancel you have to call, or send them a letter! However, nobody answers the phone!!! Nobody takes your information to cancel. You wait on hold when you call, and nobody ever gets back to you. Some sites are tricking people into buying two products, and letting them think it is a free(low priced trial) for just one product. Then, they get bills of nearly $200 placed onto their credit cards. Fantastic Claims And a Hidden Catch! You see the ad copy claiming all the wonderful benefits of these smart pill supplements. They prey on us because we age and experience some reduced mental function! So, these claims are sure to capture our attention! Everyone is always looking to improve our health and well-being, especially the elderly. They are in need of help for the age related declining in mental functioning abilities. So, when someone is making fantastic claims, and telling you the claims are medically proven, 100% guaranteed, and offer a risk free trial for only $5, it is pretty hard to pass up! But beware! It may not tell you about all the details. Some of these fantastic claims prey on your emotions. Everybody wants relief from these problems! Are you are struggling to get a promotion at work , just take this pill! 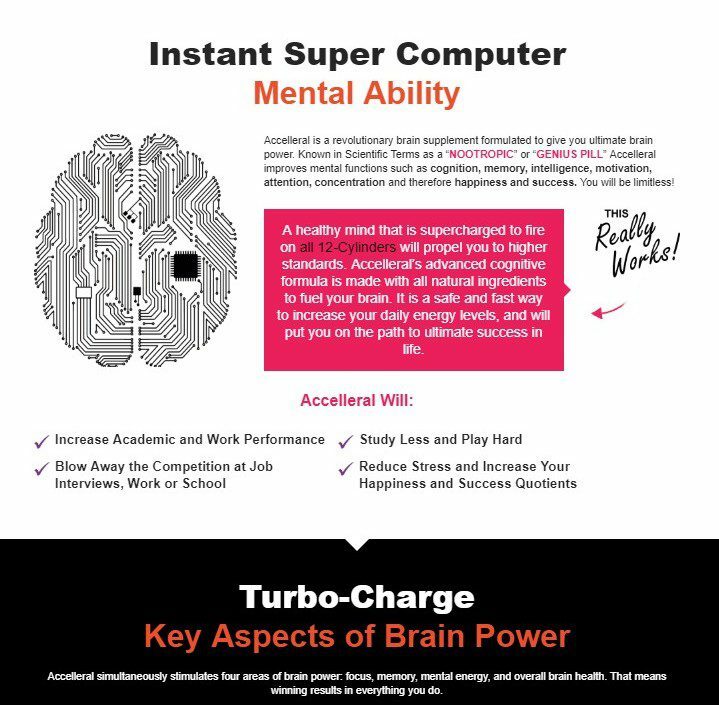 Do you want Increased happiness and the ability to play harder! This pill can increase your stamina and allow you to do that! Sounds wonderful. But, does the product deliver on these promises? The Claims-100% GUARANTEED!– DOCTOR TESTED!– RISK FREE TRIAL! Where are the Doctor Tested results found? The risk free trial is ONLY RISK FREE IF YOU FIND THE FINE PRINT TO READ! Any newsletter subscription online has to provide you a double opt in option. Where does it mention any monthly plan? Where is the price of this product, other than the cost of the risk free trial? No where to be found on this ad. They surely don’t want you to know it’s going to cost you $90 each and every month! A MONTHLY SUBSCRIPTION for $89.95. Enrollment is automatic and without your knowledge. If so, then it is not a RISK FREE TRIAL! They show no cost of anything, you will see that at the checkout! The terms and conditions are found at the bottom of the smart pills online website page in very small, very faint text. YOU MANUALLY HAVE TO CLICK ON IT. Then, you must scroll to the very bottom to READ THE TERMS– and find out you are agreeing to a monthly charge of $89.95 – If you don’t cancel this by calling a phone number given in the terms and conditions, within a limited time, You agree to pay $89.95 every month. But guess what, Nobody answers the phone! You Can’t Cancel!! Oh yeah, and the 100% guarantee…you have to keep taking the supplement for 30 days, to QUALIFY FOR A REFUND! I wonder why they say if you get sick or have any bad reactions, it’s between you and your doctor, regardless of what they say on the website!! This time it wasn’t that I fell for some new scheme, it is blatantly deceptive practice. Lately, many online sites are doing this very same thing. Everyone needs to report all of them to the FTC ! IN fact this type of practice is outlawed by the FTC. In their article titled “Risk free trials were bait for rip offs” they explain how people signed up for Free Trials, and were enrolled into monthly subscriptions without their knowledge or permission. The FTC gives these directions if you get trapped A bogus “Free” trial. If you enrolled in a free trial offer from a marketer that overcharged you, contact the company. If the company won’t give you a refund, call your credit card company to dispute the charge. Ask the credit card company to reverse the charge because you didn’t intend to order the additional merchandise. If you were wrongly charged for a free trial offer, report it to the FTC. Report them! Each and every time we get caught up with these horrific websites, let the FTC know about it!! Some of these guys have 70-or 80 sites!! They need Reported!! No matter how hard anyone searches for wording that would give a clue into anything being wrong, It is not there! Well, it’s very well hidden. They lie and say it is clearly printed on their site, but in a very obscure area, not right under your nose! There are no fancy words or double talk, and nothing that will say anyone agreed to any special terms or conditions. THE TERMS AND CONDITIONS OF a Risk Free Trial ARE a TOTAL CONTRADICTION. The actual cost of Acceleral, was not listed anywhere in the ad. Beware of any product that does not list the regular price anywhere! Your focus is on the Risk Free Trial, and you are being distracted from the actual cost! This is done to confuse everyone. The ad states “no obligation” , and try the “risk free trial offer”. I felt it was safe to buy. Boy, was I ever wrong! To see a product making these claims, I honestly wanted to try the product, but I didn’t want scammed! Hurry, supply is limited!!! This product is going fast! A gimmick used to sell products all the time. That is exactly why special sales are so effective. These and other gimmicks are outlined in How to Tell it’s a Scam. They are trying to convince you that demand is so high, you won’t get it unless you buy the product right now! It was the no risk clause, that assured me the product was safe to buy. So, what did I have to lose? The trial cost $5 and worst case I would never see my $5 again. Unknown to me this RISK FREE TRIAL OPERATED UNDER terms and conditions in the tiny print at the bottom of the page as shown in the picture above. The purchase form does not contain any information about any subscription fee what so ever! So I ordered. But wait, a strange new twist developed in my case. What happened next is really how the scam works! I found the subscription trap the next day, so I called the number they provided. My intention was to cancel my “Free” Trial Offer. And 30 mins later, elevator music still playing, nobody answered…and so I kept on trying everyday, three times a day, for a week and still nobody answered. Wow, amazing how busy they are!! So, they give instructions to call them, but they don’t answer the phone. They ignore you. I had enrolled into the $89.95 monthly charge without any knowledge of it. And the company won’t answer the phone to allow you to cancel! 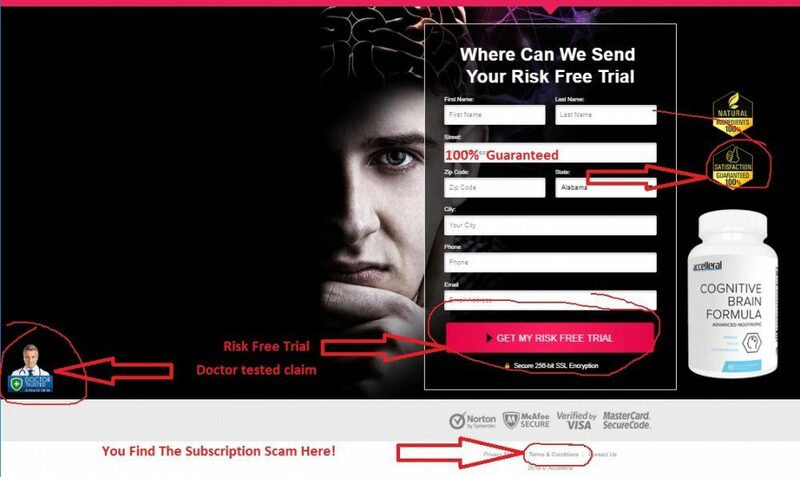 RISK FREE TRIAL and a 100% GUARANTEE?? – Such a lie! The ingredients listed in Acceleral are common supplements. Ginko Bioba (leaf) Extract – ? All the ingredients, with the exception of Bicope Monnieri, I already take (or have taken) in daily supplements. Accelerall did not show a label or list any ingredients used in their product. Bacope Monnieri in 450 mg capsules, sells on Amazon in 90ct bottles or a 2 month supply for around $18. There are also several different brands of smart pills online and formulas to choose from.. And nearly all the products are much less costly. To pay $90 a month is definitely a very expensive price for Bacope Monnieri. and it is only a one month supply. Is Bacope Monnieri effective in making you smart? According to Wikipedia, it displays some antioxidant properties in animal studies. It is used in Ayurvedic treatments for epilepsy, asthma along with ulcers,tumors spleen enlargements, and various other inflammations, leprosy, anemia and gastroenteritis.But, nothing about making you more intelligent. Research IN ANIMALS has been shown to inhibit acetylcholinesterase, a suspect compound linked to Alzheimer’s disease. It also activates choline acetyltransferase that in turn also controls Acetylcholine , which increases cerebral blood flow IN ANIMALS. And may have some protective effects IN ANIMAL MODELS of neuro-degeneration. A few small clinical trials in Humans found some promising evidence for memory recall, but research for other cognitive claims in humans remains unknown. So, it may help to protect the brain, but does not make you any smarter! Bacope Monnieri may cause nausea and gastrointestional upset when taken on an empty stomach. Another known fact about Bacope Monnieri use is malaise, or relaxation. After I took the product, I had reduced desire to do much of anything, and felt extremely tired all the time. I can’t feel like I want to sleep all day! Bacope Monnieri takes a long time to be effective. it may take 4 to 6 weeks to become effective, if it even helps. That is why they insist on you taking it for at least 30 days, well I can’t tolerate it. Personally,I would prefer to get the Phospholipid complex in NEURO -PS GOLD. The Phospholipids form the basic structure of the brain cells that help to keep moisture in the cells. Maintaining moisture within the brain cell, keep these cells alive. The Phospholipids also help with the bio-availability of nutrients along with the permeability of cells. And the cost is much less. Sorry, I don’t want any $90 subscription! The reason I bought the Acceleral is because I had purchased a similar product in the past called Neuro-PS. The cost of this product is in the price range of $15-$20 for a one month supply. So, right away this is a similar product for a lot less money! This product is manufactured by Puritian’s Pride. I used many products from this company for years, and never got caught in any subscription scam. The label clearly lists all the ingredients and in what quantity they are used. I actually used this product. Overall, I did like the Neuro-PS product, but thought I would try something else. I never expected it would turn into such a nightmare! As we age is it likely we will all notice we get more forgetful, and mental focus may not be as sharp as it once was. Smart pill product marketers are aware of the growing demand for their products as well. The more medical proof manufactures can attach to their products, the better the products sell. We all want to see medical proof, but that will not make me believe any product is worth a hundred bucks a month! The label should include what ingredients the product contains. I want to know how much of each ingredient is in the product. I can’t spend $90 per month on some supplement that has a bunch of hyped up claims in the ad. And never told me up front about any subscription plan automatically costing me $90 per month. Articles published in Forbes Magazine, claimed Billionaires were endorsing smart pills online. This was done without their knowledge or consent. These ads stated celebrities, like Warren Buffet, and Bill Gates enticing statements praising their products. They listed testimonials that were fake, and added the credibility these people swear by their products. Not one word of it was true! Advertisements showed Warren Buffet, Bill Gates and Mark Cuban in ads and making claims they all used Smart Pills with wonderful results! However, all of it was done without permission from anyone. It was fake pictures and testimonials. This ad included a fake book cover of National Geographic! Anytime a product has to use a hidden monthly subscription to get your money, it is a scam! Even if the product has any merit at all, the subscription trap is deceptive, and morally unethical. If there is no price of the product anywhere, the door is wide open on how much it costs, its a scam! Always scan the whole website for any terms and conditions even to the bottom of the page! If you have any questions or need more information, please leave a comment below. Tired of your same old 9-5 job? Want to change your life? Check it out for free! I fell for something similar to this. It wasn’t for a smart pill but it was a weight loss pill. The pill didn’t work, but it was also almost impossible to cancel the monthly payment of $50 for a bottle. I had to contact my credit card and report a dispute in order to get my money back and stop the transactions. Ugh, I never signed up for anything like that again. They just want your $5 and your contact and billing information. Thank you for sharing this article to let other know of being weary of these smart pill scams. I honestly don’t think there is such a product that would help boost your brain. we feel foolish when it happens, but the scammers are experts on tricking us. I contacted my credit card and told them they were a scam, and they basically said they couldn’t do anything about them. But, as soon as I said the FTC has them listed as a scam, they got real quiet. I disputed it, and told them to stop payment. The scammers typed the account name in capital letters, and the credit card approved it! I cancelled the card! It is going to get harder to avoid the scams, because Trump rolled back the regulations protecting the consumer! Thanks for taking the time to comment! Thank you very much for sharing this scam, so that we don’t happen to make the same mistake. I guess this just goes to show that like the old saying goes — nothing is free in life. Also this post proves that we need to read the fine print of things before we buy them. I think online products are also notorious for saying the price is one then bombarding you with upsells after you join. I hope that it does not become standard practice to offer free trials and continue to scam people! This particular scam was very hard to find the fine print to even read, it was designed to scam us. Upsells are one thing, as long as they are upfront and let you know what the actual cost is going to be! I did get my money back. Thanks for the comment! Everyone surfing the web should always be scam conscious because we can’t just review all the scams. They are numerous and the rate at which spam emerge on the web daily. At any time while surfing the web something could just pop up and could even contain dangerous and deceptive content . Yes we need to be careful surfing the web. Some sites are dangerous to enter and could infect our computers. A good antiviral software is our best defense. Scammers like these are hoping that there will be some folks who won’t notice the $100/mo charge and let it run for several months prior to stopping it. Disgraceful! It’s amazing how compelling their ads are too. I’ve been taking Life Extension NeuroMag and NeuroPeak by Zhou. Both of which have worked well. I can tell the difference when I go too long without a dose but I don’t take them both the same day because it will give me a headache. I is almost impossible to find out that they are going to charge you $100. they hide it very well,so deceptive. Yes, they make it sound like the fountain of youth! Which product do you like better? I got a bit of a dizziness feeling from some of the nootropics. I don’t really like taking them. Thansks for leaving a comment. Hi Chas, thanks for writing such a great, informative piece here.The online world is full of rubbish and promises and it really can be a dark marketplace.When folks like you publish material like this it helps to counter the scams that are out there online.Such terrible deceit,promising a $4.95 fee and taking $90/month!! I hope youre article helps to stop the flow of customers to this site as well as catch those responsible!! Thanks for the kind words! Telling others about our misfortune is the only way to alert others. Sometime, we refuse to pay attention until we fall into the trap ourselves. Another article that helps warn people is the Big Book of Income Review. Thanks for leaving a comment. Thanks so much for being willing to share! We all make mistakes and can fall prey to these types of scams. It’s amazing the methods they use to try and bait people in. It really is sick the lengths people will go to in order to take other’s money away! 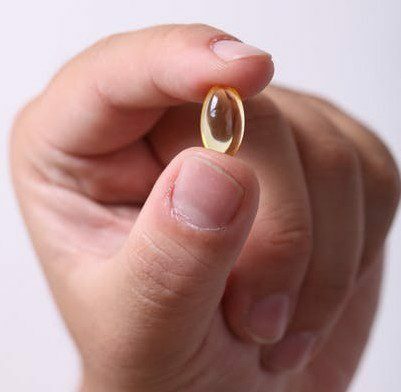 I am always wary of supplements in general, but ones that promise miracles (when they have the same ingredients and amounts as common, over-the-counter vitamins) are always on my radar. If there is anything I’ve learned, it’s that these types of products also love to throw around the term “proprietary” as if it some magic word that means you’d be missing out if you didn’t buy. Usually, it’s not all it’s cracked up to be. Thanks again for writing this and hopefully saving others from making the same mistake! You are right, the scammers stop at nothing to get your money into their pockets. Yes, sadly we think people are being honest when they sell us their snake oil cures. I think they should be held accountable for the product claims. Thanks for taking the time to comment. I gotta say a huge thank you for this! I am tired of so many people unfortunately getting scammed by fraudulent people who know how to use word play to entice people in to believing something will work, or some how they will get a money back guarantee. You are doing a great service to the community! Thanks, I am glad you like the article. It was my goal to help others when i started the site, and I still try to achieve that today. I know what being scammed feels like, and it is not pleasant. Thanks for the comment. I’m glad I found this site. I like to research pills and items that can be taken to improve cognition and memory. I haven’t come across this particular pill but I easily could have. Thank you for talking about your experience and discussing the topic of scams and frauds. Keep up the good work! I think they may have changed the site, but they are still selling it. I noticed they use several brand names. Thanks for leaving a comment. Thanks for sharing your bad moment. I won’t lie here, I almost fall into it too, they promise this pill will solve your problem in a fantastic way you can almost get hooked on the title! It will be so fantastic to being able to solve out a health problem with a pill, and I don’t know how these people can keep working on it, and the bad side of it, it’s many people will buy it. So sorry to hear about your bad story on this, but I thank you that you share your story to help many to stay away from it. The pill is only part of it, the monthly payment of a hundred dollars a month, each and every month for this pill that is nothing but common supplements! And they trick you into thinking you are going to pay just $4.95 and try it first!! I don’t think their website is up anymore, and it should have been pulled down by the FTC. This is just robbing people! Thanks for your kind words and taking the time to leave a comment! That’s a pretty upsetting story. Selling supplements, especially such for improving brain memory and then hide a monthly fee in the free trial. I guess these scam artists hope the customers buying these supplements forget about the order and the promised free trial and think they have to pay the product when the bill arrives. Very bad indeed. Thanks for outing these practices and the brands practicing this method. I am here to tell you,I help people who get scammed. And lo and behold I get caught in that trap! Never again, will I trust any free trial anywhere! it is pretty bad, that the FTC banned this practice, and yet some still do it! My gut feeling is that they know that the FTC is on to them, because I got no complaints from the company when I cancelled the card. My real issue was with the credit card companies! They alerted me when The transaction occurred that it was a flagged site! Why did they let the transaction occur, if the FTC has banned this practice?? I will keep publishing these actual scams as long as I can! Thanks Stefan for taking the time to comment, it is appreciated! I have met lots of university students who are getting into these nootropic and smart pills but I would be surprised if any of them would ever let on that they have been scammed. Chances are they have and just don’t want to share. The biggest red flag for me is always the time restrictions. As soon as I see them I normally tune out automatically. Sometimes it means paying extra if I want something but you learn to live with that once you know you are not getting scammed. Keep up the good work Chas. Moral is: Don’t automatically believe everything you read on the internet or see on TV. I agree, nobody likes to admit they have been scammed. The favorite with students are the prescription drugs Ritalin and Adderall which are stimulants. But, if they can’t get those, they would turn to the nootropic supplements and likely get scammed when they do.We are so busy nowadays that we just sometimes ignore the red flags and get into trouble. I should have known better! Thanks for taking the time to leave a comment, and please stop back. One of the things I have learnt was a course in critical thinking, or argumentation. It has been one of the most useful courses to me since my typing course. There’s probably more. Since I took that course, I rarely get taken in by faulty advertising. The methods they use are legal but can seriously mess with people’s ability to buy using their intellect rather than emotions. This causes impulse buying. I’ve seen people complain up and down because they have been taken by stuff like this (and just about everything else under the sun) for exactly what you pointed out – They don’t do their due diligence by looking for those disclaimers. The more hidden the disclaimers are, the higher the possibility of a scam. I see this all the time in my digital product reviews. The bad thing about it is, if the disclaimers are there and they state the very things that would prevent a person from being burnt, there is little one could do about it but pay and hope they can negotiate a way out of it. Being burnt yourself, you know how important it is to look into it before proceeding. Else, stay with Puritan Pride, a known and trusted company. You are absolutely correct. We must all be wary of everything we do, because nobody else will look out for us. Marketing nowadays has become an art of deception. Most people, myself included do not think they are being scammed when the free trial is offered. Sadly, it is also being used in totally misleading ways. Thanks for stopping by and taking time to comment.